Ed McDowell passed away on Friday, December 18th, 2009. He was a great teacher and a wonderful husband, friend, father, grandfather and great grandfather. Ed's memorial service was held on Sunday, January 3rd at the Kittitas County Fairgrounds. At last count, there were over 500 people in attendance, including a good number of 1979 graduates. Contributions may still be made to Hospice, Seattle Children's Hospital or a charity of your choice. Our new class tile on the Legacy Wall at EHS. 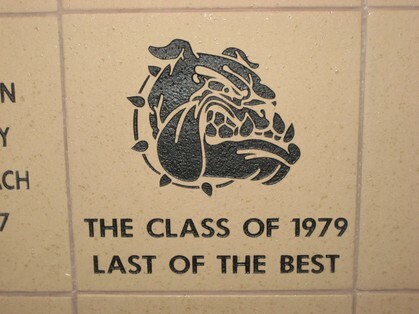 We are the first tile to feature a Bulldog! There are 5 staff members who are listed in our senior yearbook who are still very involved at EHS in 2009! Dave Keller teaches all geometry classes and coaches tennis. He is also the senior class advisor. He hasn't changed a bit. Glenn Weitz, although retired from teaching, coaches the girl's varsity soccer team. He loves the game. Debbie Rowden teaches English, sophomore honors English and is the sophomore class advisor. She is also very involved in district activities, lending her experience and wisdom. She says our freshman year was her first year of teaching! Lynn Weissenfels, also retired from teaching, continues to take many senior pictures and does weddings. He has kept up really well with technology, and is completely digital and computerized in all his work. In addition, Al Moss sits on the Kittitas Valley Community Hospital Board and is very involved in Rotary. He's incredibly active and in great shape. Emily Stevenson just recently retired after winning all kinds of awards for a student consumer program she designed in her Family and Consumer Studies classes. It is being used as a template all over the U.S. Steve Hall also recently retired from teaching English. Recent losses: Ed McDowell passed away on December 18, 2009. He will be missed. We lost Arch Andreotti a few years ago, but not before dedicating a new sign on Andreotti Field in the fall of 2002. Coyne Burnett passed away in 2008, and had just recently been invited in to the EHS Chamber Choir classroom to hear a song he had written. It meant a lot to him. Vera Dudley recently passed away, and had spent her retired life dancing, traveling, hiking and skiing. An incredibly active woman! If you have other news about staff members, let me know! Ellensburg High School held graduation in William Brown Gymnasium on the high school campus until 1984, Beginning in 1985, graduation was held in Nicholson Pavillion on CWU's campus. (Correction: According to Joy Lessard, Journalism teacher who took Steve Rogers place, she photographed graduation at Dean Nicholson her first year at the high school- 1983). The graduating class of 2008 actually held graduation outside on the CWU football field because of the renovation of the Nicholson gym complex. While the wind wasn't an issue, it rained! What are the odds? The Nicholson gym is now finished and graduation will return there this June. And, the new complex has air conditioning so that will be a plus. Although there have been larger classes from year to year, the actual size of the graduating class has remained around 200, give or take a few. The top 10% celebration continues to be a big deal. Where our graduation ceremony combined scholarship announcements and the presentation of diplomas, EHS now has Baccalaureate on Sunday night, a scholarship night on Tuesday, and graduation on Thursday. During the 2005/06 school year, the Washington Interscholastic Activities Association (WIAA) did a reassessment of the entire state regarding enrollment and athletic classification. Once all numbers were in, Ellensburg fell into a 2A classification instead of 3A. And, the Mid Valley League ceased to exist. EHS now competes in the CWAC (Central Washington Athletic Conference) and has had outstanding success. Teams in the CWAC league are Prosser, Grandview, Toppenish, Wapato, Selah, East Valley, Ellensburg, Ephrata, Quincy and Othello. A few of our biggest rivals, West Valley, Hanford and Sunnyside, now compete in a 3A/4A league with Eisenhower, Davis and the Tri City schools. Interesting football fact: in the fall of 2002, EHS beat Prosser for the first time since 1978. It's been a more even rivalry in the past few years.